It was the weekend of the Prague Post Heavy Hitter's tournament. G-Man called me up saying he need a place to take 12 people -- players and families. "Short notice on a Friday night? Could be tough." I said. Then it came to me. 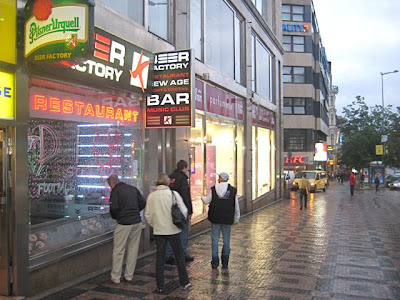 "Try Beer Factory." 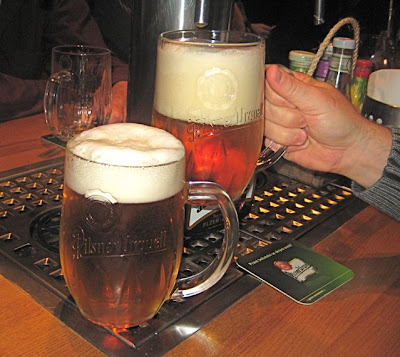 It's a subterranean restaurant on Wenceslas Square with beer taps on the table. 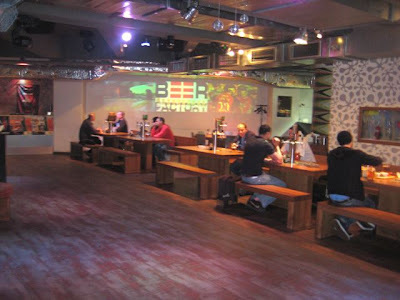 Now, if you read my post on Beer Factory from two years ago, you'd know I hated the place. So why recommend it? First, I had a feeling (correct, it would turn out) that they'd have space for a big group at the last minute. Second, it was central. Third, some people get a kick out of pouring their own beer, even if they do it badly. 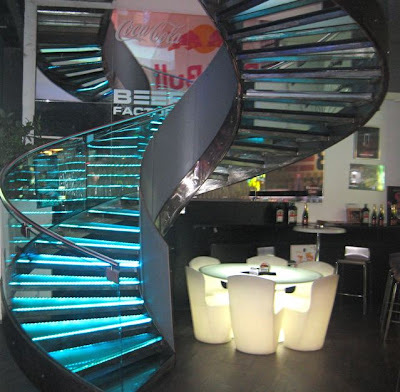 I had to descend on their spiral glass staircase once again to check it out for myself. My original Beer Factory post got tons of hits from Google searches. At first, this mystified me. Then, it started making more sense as I read the blog comments. A number came from what I believe were 20-something male tourists telling me I was an idiot. 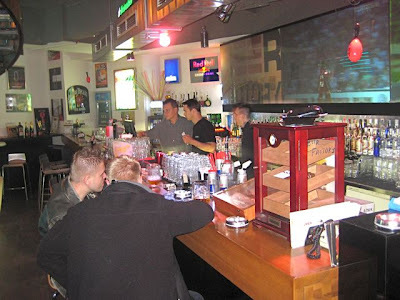 For example, "Aron Hungary" wrote to say, "Cold & good Pilsner, drinking contest, party from about 10.30 with 20 years old girls from all around the world... best place in Prague!" The main drinking and dining area isn't much to look at. Very industrial. Concrete floors with exposed duct work exposed on the ceiling. The bar area has only a little more going on visually. I arrived late, joined the group, and poured myself a Pilsner Urquell. It was 45 CZK for a half-liter, which isn't a great price, but not over the top for the center of Prague. I still didn't think it tasted particularly good, but it was far better than the nasty tasting brew I had on my last visit. 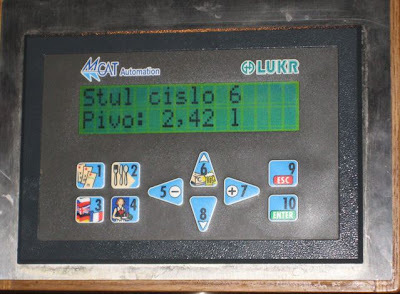 A little meter on top of the tap keeps track of the amount you've poured. 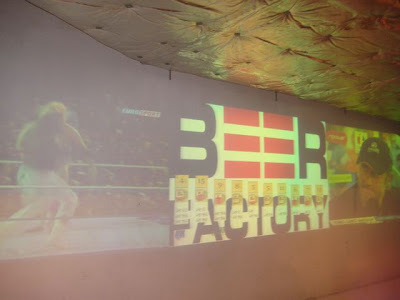 There is also a projection on the wall that tabulates how many beers each table has had. They also show sports. Thus, they combine our innate competitive drive with the acquired desire to drink ourselves senseless. Genius. I got a look and a few tastes of what other people ordered. 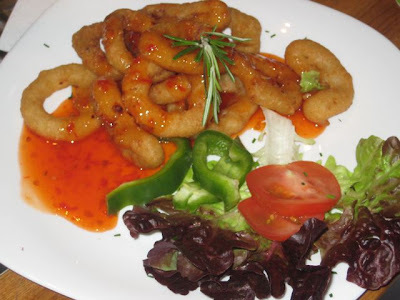 Everyone said they liked the onion rings (115 CZK). They were similar to those from Burger King. However, these rings were bigger and crunchier -- sort of like fried breadcrumb rings, with not too much onion flavor. I was sorry they decided to pour sweet chili sauce over the top instead of putting it on the side. It wasn't a very large portion so I thought the price was high. I should also note now that, as if this writing, their internet menu prices were low by around 20 CZK. 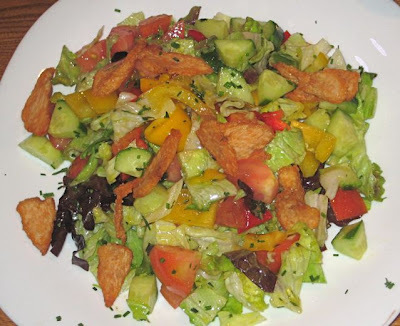 A guy at the table got the Thai chicken salad (185 CZK). I didn't know him well enough to ask for a bite. "What do you think?" I asked. "I don't know. That chicken looks pretty dried out." I said. "Yeah, it's not so good," he confessed. A quick flip under light interrogation. He liked the dressing, but otherwise it looked pretty boring to me. G-Man and another guy got the spicy beef fajitas (180 CZK). 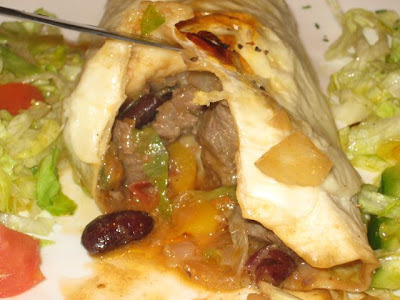 It was really a burrito, with a few red beans, onion, tomato, and even chopped zucchini inside. Both described it with words like "dull" and "bland" and "mediocre." 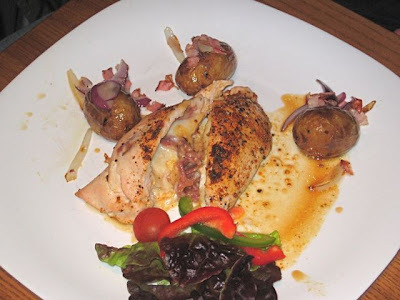 Another person had the chicken with Parma ham and goat cheese along with bacon onion potatoes (265 CZK). "Nice idea, poor execution," the guy told me. The flavor was lacking. 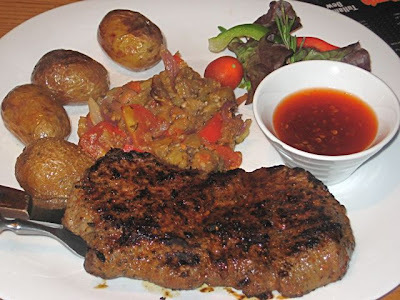 For myself, I decided to try their Argentinian beef steak. The 200 gram version is 310 CZK, but I got the 300 gram cut for 400 CZK. It was heavily seasoned with salt and pepper. I thought it tasted pretty good. G-Man tried it and liked it as well. There was a ratatouille-like side of eggplant, peppers, and onions. Pretty good. However, they didn't asked me how I wanted it cooked, and it came out well done. 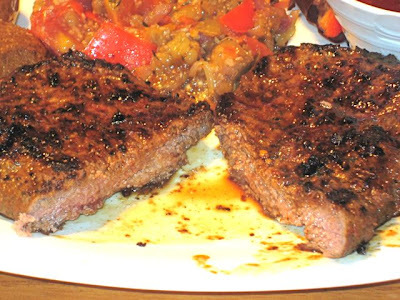 It was a shame because it would have been so much better and more tender if had been cooked to medium or medium rare. Overcooking made it less juicy than it should have been. The new potatoes on the side were not good. They were overcooked -- mushy and watery. As for the general atmosphere, it was a very noisy place. 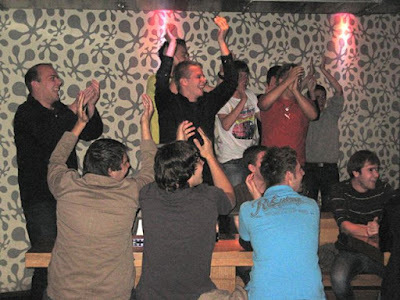 A table of football fans rose up regularly for rounds of chanting and clapping. They looked like they were having a great time. I wasn't following their game, so it just served to shut down our conversation. At the stroke of 10 p.m., all conversation ceased anyway. Thumping dance club music began. I've heard from commenters that it can be quite a party there sometimes. It just wasn't our thing, so we left soon after. I still have big problems with Beer Factory. But what do I know? G-Man's out-of-towners seemed happy enough at the end. They'd never seen beer taps on tables before. They really enjoyed that. As Homer might say, "Woohoo!" As for me, I'd say that on this particular night, Beer Factory was both the cause of and solution to everyone's problems. 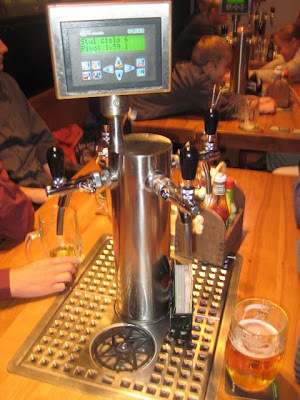 The idea of tapping your own beer is a gimmick, but, as you very well point out, an effective one at that. As a beer enthusiast, however, the whole concept is quite silly. Tapping beer is considered a bit of an art form in this country and there is nothing on this planet that will talk me into paying 45CZK(!?!) for a pint of Pilsner Urquell that I have to tap myself.